It’s that time of year again! December is upon us, we have one major holiday behind us, and a few more to go! At the end of each year it is recommended that you tidy up your candidate and requisition data to get ready for the new year. Having worked with thousands of administrators, recruiters and hiring managers for years, we have put together a simple list of suggested to-dos to get you ready for 2019! Search for any candidates that have not been reviewed, and move to a Not Selected Status. Email candidates with a Not Selected email, it’s good practice. Review any users who no longer need access, and update your list of active users and contacts. Don’t delete old users, to preserve their history, change them to an “inactive” status instead. Remove any expired job listings from your career site. Create any reports you need to save. Early January is when a lot of potential candidates decide to look for a new job, often as part of a New Year’s Resolution. Schedule jobs or get them approved to post early in January for maximum exposure, especially if you have planned time off. Schedule your social media advertising for jobs. Plan your budget for the upcoming year. Schedule an email blast to let applicants know you are looking for new hires. 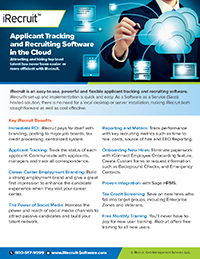 Schedule any training you need for iRecruit in 2019. Add any important dates or reminders for 2019 to your iRecruit calendar. If you need any assistance, please contact us here or call 800-517-9099. This entry was posted in Blog, iRecruit Blog. Bookmark the permalink.